Phoenix Dry Fly 7001 fly hook are made of the fine high carbon steel, which is hardened and tempered to an exacting formula that makes for a long point life and a very strong fly hook. We also chemically sharpen our hooks in a special bath that strengthens their points. We offer a most popular variety of hook patterns for every fly tyers needs. Please look over the entire range of BFC Phoenix Dry fly hooks. We hope this section of our website will help you in finding the perfect hook for your perfect fly. BFC Phoenix 7001 hooks are classic, strong, all purpose dry fly hook. Great for tying all your favorite dry flies from caddis to mayflies. 1X strong wire fly tying hook with a round bend and turned down eye. Forget. Very strong and reliable. Phoenix Nymph 7003 fly hook are made of the fine high carbon steel, which is hardened and tempered to an exacting formula that makes for a long point life and a very strong fly hook. We also chemically sharpen our hooks in a special bath that strengthens their points. We offer a most popular variety of hook patterns for every fly tyers needs. Please look over the entire range of BFC Phoenix Nymph premium fly hooks. We hope this section of our website will help you in finding the perfect hook for your perfect fly. BFC Phoenix Nymph hooks are 1X long, have Sproat bend, and 2X strong wire, so your nymphs and wet flies sink well without added weight. These hooks are great for fishing large trouts or grayling. Forged. Very strong and reliable hooks. 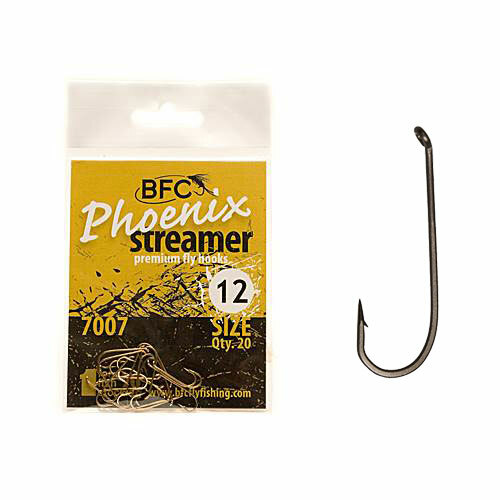 Phoenix Streamer 7007 fly hook are made of the fine high carbon steel, which is hardened and tempered to an exacting formula that makes for a long point life and a very strong fly hook. We also chemically sharpen our hooks in a special bath that strengthens their points. We offer a most popular variety of hook patterns for every fly tyers needs. Please look over the entire range of BFC Phoenix premium fly hooks. We hope this section of our website will help you in finding the perfect hook for your perfect fly. BFC Phoenix Streamer hooks is our favorite Woolly Bugger hook for fly tying. Good for streamers and long nymphs such as stoneflies. Versatile for tying many fly patterns, its down-eye and classic round bend makes this hook a top choice. 2X strong. These hooks are essential gear for serious fly tiers. Forged. Very strong and reliable. Phoenix Scud 7009 fly hook are made of the fine high carbon steel, which is hardened and tempered to an exacting formula that makes for a long point life and a very strong fly hook. We also chemically sharpen our hooks in a special bath that strengthens their points. We offer a most popular variety of hook patterns for every fly tyers needs. Please look over the entire range of BFC Phoenix premium fly hooks. We hope this section of our website will help you in finding the perfect hook for your perfect fly. The ideal continuous bend, down-eye 1X short-shank hooks. Strong 2X heavy wire hooks for tying your favorite scud, caddis, or shrimp fly patterns. Forged. Very strong and reliable. Phoenix Mayfly 7014 fly hook are made of the fine high carbon steel, which is hardened and tempered to an exacting formula that makes for a long point life and a very strong fly hook. We also chemically sharpen our hooks in a special bath that strengthens their points. We offer a most popular variety of hook patterns for every fly tyers needs. Please look over the entire range of BFC Phoenix premium fly hooks. We hope this section of our website will help you in finding the perfect hook for your perfect fly. Chemically sharpened 2X long and enlarged eye make this the ideal hook for tying mayflies with. Forged. Very strong and reliable.